Precision made stainless steel rule. Graduations in metric and imperial. 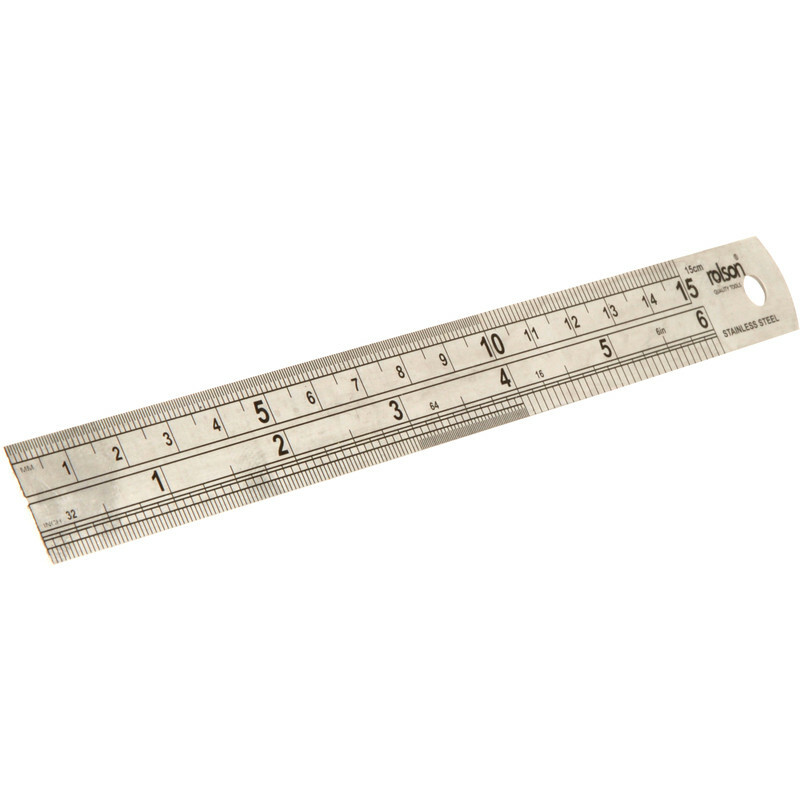 Stainless Steel Rule 900mm is rated 4.6 out of 5 by 27. Rated 5 out of 5 by 114dBA from A sturdy 6 inch rule I bought this rule a month ago and I'm not sorry that i did. It was to replace a 6 inch metal rule I had lost. This one is sturdy and substantial, it is not going to bend unless it is used to prise open a door etc. It markings are in centimeters and inches. The centimeters are subdivided into millimeters and half millimeters which suits my purpose when I am setting up guitars, and the inches are subdivided into 1/16ths, 1/32nds and 1/64ths. The reverse side has a table of conversions between metric and imperial sizes and another for Tap Drills and another for WW to UNF. Admittedly these last 2 conversion tables are printed small, but the info is there if you need it. The rule i lost was much thinner and it ended up with a bow in it after a little use, I can't see that happening with this one! Rated 4 out of 5 by Aerialman 1 from It's a stainless steel rule. Purchased in the last week. Does what it is supposed to do. Edges somewhat sharp though. Rated 5 out of 5 by Sdiyer from Great! Good quality and accuracy for the price. Rated 5 out of 5 by DaveDave from This rule rules Great for measuring up to 150mm. Not so good for longer lengths. Rated 5 out of 5 by Middy from Top quality Top quality for such a low price! Rated 5 out of 5 by Skitarii from strong rule strong flexible rule, with conversion table on rear. surface printed, so will wear over time. Rated 5 out of 5 by TooComplicatedForMe from Very Useful tool at a great price. I bought this for my wife to use in her curtain making. She was struggling with a short ruler this has really helped her. Got me some browny points too.